A re-released edition of the action game Assassin's Creed: Liberation, previously released for PlayStation Vita, now converted for PC Windows and home consoles. Assassin's Creed: Liberation HD is a re-release of Assassin's Creed III: Liberation, originally designed for the PlayStation Vita portable console. The original production was a spin-off of an extremely popular series of action games by Ubisoft, telling the story of the eternal conflict between the Order of the Assassins and the Knights Templar. The version for PCs and stationary consoles, in addition to improved graphics, includes a number of changes in gameplay. The story of Assassin's Creed: Liberation HD coincides with what is offered on the original version for PS Vita. 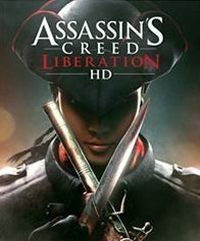 The player assumes the role of Aveline de Gandpré, dark-skinned resident of the New Orleans, who decides to fight for freedom and justice in the ranks of the Assassins. In contrast to previous protagonists of the cycle, Aveline is in no way affiliated with Desmond Miles. The story takes place in the years 1765-1780, a crucial period for North America. The heroine spends most of her time in New Orleans and surrounding areas in the state of Louisiana. In the course of her adventures, she meets Connor Kenway, the protagonist of Assassin's Creed III. Traditionally, the core of the game is free exploration of open spaces, climbing on all kinds of buildings, and performing different missions. The tasks usually are about killing, tracking, theft, etc. Aveline copes well in fights against multiple opponents at once, deftly using different types of weapons. Liberation applied some innovation to the series, that being disguises which allow to confuse the opponents. The gameplay in Assassin's Creed: Liberation HD was improved compared to the original. Under the influence of fan reaction to Assassin's Creed III: Liberation, the developers modified a part of the missions. The game also has improved graphics powered by the AnvilNext engine. Transferring the game into monitors and television screens required adjusting it to higher resolutions, adding new graphical effects, objects, textures, etc. In addition, a dynamic cycle of day and night and refreshed models and facial expressions were introduced. This unofficial guide for Assassin&#8217;s Creed: Liberation HD, to make it possible, for all players, to complete this game in 100% easily.